The map, a pencil-and-ink drawing on paper, is roughly three by five feet. It was hastily sketched by Disney and his friend Herb Ryman over a weekend in September 1953. The map was created as part of an effort to secure funding to build Disneyland. Los Angeles: The original, first-ever map of Disneyland sketched by Walt Disney in 1953 has been sold for a whopping USD 708,000 at an auction in the US. This made the work the most expensive Disneyland map ever sold at an auction. The map - one of the most important drawings in Disney history - was created as part of an effort to secure funding to build Disneyland. It depicts areas of Disneyland that never materialised - such as the "Lilliputian Land" - and some that took a very different form. For example, the fairy-tale castle was originally positioned in a corner instead of the centre. Ron Clark, a collector had bought the map 40 years ago from a former Disney employee, Grenade Curran. Curran had noticed the map sitting in a corner of Walt Disney's office in 1955, and had taken it home as a memento. "I kept it because it was the first thing to show and display what a theme park would look like," Curran was quoted as saying by 'BBC News'. 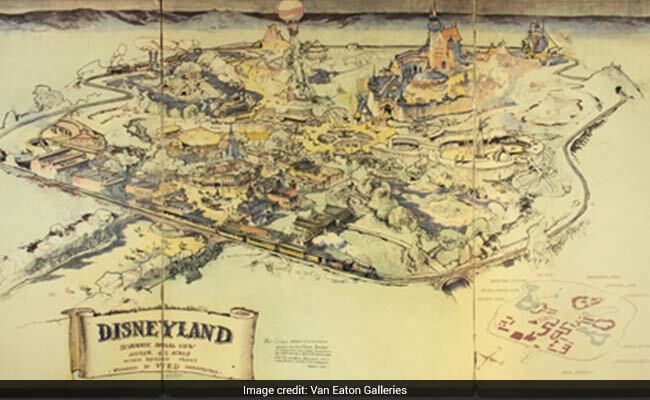 "After some pretty exciting bidding the map sold for USD 708,000, making it the most expensive Disneyland map ever sold. We are beyond thrilled that the map will continue to be appreciated and cherished," said Mike Eaton, owner of Van Eaton Galleries in Los Angeles. "That an artifact like this, which is so deeply rooted in the creation of Disneyland, still exists today is astonishing," Eaton added. Nearly 1,000 other Disneyland artefact - including original props, wardrobe, ride vehicles, and souvenirs - from 1953 to the present were also auctioned.